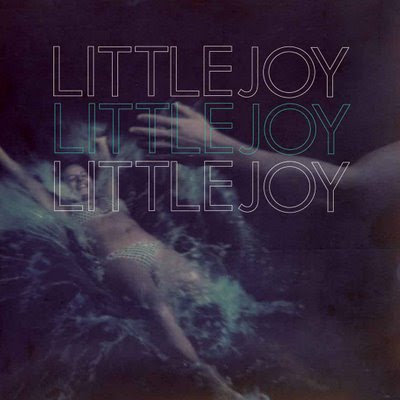 I've completely fallen for the short and sweet debut album from L.A. trio Little Joy, who hit Denver's Larimer Lounge on Tuesday night. After a chance meeting at a Portuguese music festival, Fabrizio Moretti of The Strokes and Brazilian musician Rodrigo Amarante (Los Hermanos) sat beside a river and talked about their musical leanings. Upon returning to Los Angeles, they formed this trio along with local musician Binki Shapiro. The three moved into an Echo Park house, starting recording demos, and named their project for the cocktail lounge down the street. Like a Shirley Temple, there's an innocence from another era captured here, but also a hearty dose of more modern sounds cultivated in both garages and bossa nova clubs. The sum effect feels like someone took a band like the Strokes (no denying -- Amarante often sounds delightfully like Casablancas, at the peak of his lazy lounge-singing), plunked them down in some post-war era American nightclub in Rio de Janiero, and gave them a regular gig on Tuesday nights. That's how this fantastic album feels - without pretense, eclectic, wistful . . . but music you can dance to. The singing occasionally lapses into Portuguese, the vocalists croon while the backup singers shoo-wop in Motown moments. The music clatters and sways with Latin influences and island ukuleles. Some of the slower songs --especially the ones fronted by Binki and her charmingly honest voice (listen: "Don't Watch Me Dancing")-- sound like the perfect soundtrack to a Technicolor 8mm film projecting in slow motion. Or maybe something I want to listen to on a sticky-humid night, unable to sleep in hotel sheets, while watching the ceiling fan lazily spin and waiting for an ocean breeze through the open window. Of all the side projects of Strokes members, this one checks in tops with me because there is an almost-kitschy but genuine joie de vivre captured in these thirty minutes. As Moretti said when asked about how this project came to be, he replied that "We weren't doing it for the sake of doing it; we were doing it for the love of doing it." And you can tell. Little Joy is out now on Rough Trade Records, and you should really go see them in the coming weeks if you live in any of these West Coast cities. Me, I'll be there with bells on Tuesday night in Denver. Yes yes! This is one of the best albums of the year. Can you please repost The Strokes show from Melbourne 2001 again ... the one you posted in March of this year PLEEEEEEEEEEEASE!!!!!! very good, gonna have to get more of this. i seen albert hammond jr's band on sum ifc show last week and i liked that as well. and winter break from school.